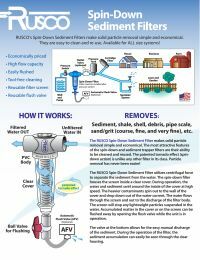 RUSCO’s 2" Stainless Steel Screen Chemical Resistant Spin-Down sediment filter is more durable than PE screens and system make solid particle removal simple and economical. The benefit of the chemically resistant 2" Spin-Down filter is its housing & head are made from chemical resistant materials for contaminated water, and its ability to be cleaned and reused. 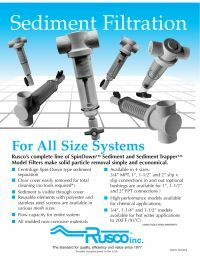 The 2" Chemically resistant Rusco Spin-Down Sediment Filter has a clear cover that can be easily removed for total cleaning. The unique tornado (spin-down action) effect created by the patented process is unique. Unique element design traps sediment in lower reservoir of clear cover.